American Cuisine, Steaks, Ribs, Pizzas, Burgers, Bar — The award-winning and extensive menu of American fusion cuisine features more than 130 items including appetizers, salads, pastas, sandwiches, street tacos, grilled burgers, individual-size pizzas, seafood, steaks and ribs. The Kids Klub menu includes fresh-to-order favorites including a selection of healthy items for the Yard House pint-size guest. The lively environment is created by colorful abstract artwork, classic rock music and flat screens in every direction showcasing the day’s news and sporting events. 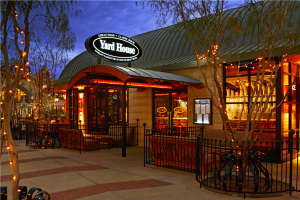 Yard House is the perfect place to celebrate a special occasion or gather your family for dinner. Yard House is the creation of founder and entrepreneur Steele Platt, who came up with the concept to create a restaurant that would offer one of the largest selections of draft beers, a diverse menu of American fare, and play a heady selection of classic rock music on a state-of-the-art sound system. On December 7, 1996, the flagship Yard House opened along the Long Beach waterfront in Southern California. The restaurant took its name from the 3-foot-tall glass containers originally designed in Great Britain and used to hand stagecoach drivers after a long journey by horse drawn carriage. Each Yard House location features a center island bar and an endless fleet of tap handles ranging from classic lagers to more obscure ales. The glass-enclosed keg room is essentially the pulse of the operation housing as much as 5,000 gallons of beer at a time. Three to five miles of individual beer lines stretch overhead from the keg room to the island bar maintaining a constant temperature of 34-36 degrees keeping the beer consistently fresh and perfectly chilled for every pint. 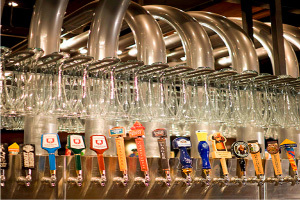 Guests can sip their favorite draft beer from the popular half-yard, traditional pint or six pack sampler.